Authorities in Lao Cai Province’s Sapa tourist town will hold a ceremony to celebrate its 110th anniversary of tourism development in early November. The event will take place on November 2 at the town’s central stadium. It will also be past time to announce the government’s decision to recognise the terraced fields there as a National Heritage. Nguyen Van Thang, from the provincial Department of Culture, Sports and Tourism, told DTiNews on August 14 that they would organise a series of activities from October 15 to November 3 to celebrate this occasion. “Major activities will be organised for three days: November 1-3,” Thang noted. Under the programme, an international seminar on preserving the cultures of ethnic groups in mountainous areas will be held in combination with sustainable tourism development. Several other activities include: the Fansipan Mountain Discovering Programme and the Sapa street festival plus a programme on discovering the cultural heritages of ethnic minority groups in Sapa. “Visitors will also have a chance to enjoy Hat giao duyen, traditional folk songs by Dao Do ethnic minority people and wedding rituals by Giay ethnic minority people,” he said. 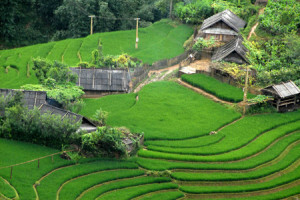 The department will, in co-ordination with Sapa District People’s Committee, organise a photo exhibition to provide visitors with updated information about tourism in Sapa and its development plans. According to the department, Lao Cai welcomed 640,290 tourists, including 278,700 international arrivals during the first half of this year. Its tourism revenues reached nearly VND1.3 trillion (USD61.35 million) during the period.